Smart grid proponents like to talk about the "Home Area Network" – a communications network for thermostats, appliances and electronics that can display the energy they're using. But getting there will take a lot of time and money. Back in 2006, researchers at Pacific Northwest National Laboratory set up 200 Washington state homeowners with appliances and displays that tracked and transmitted their energy use – a test run of the potential for the much-vaunted "smart grid" to reach into people's homes. The idea behind the GridWise project was to enable utilities and homeowners to become informed partners in saving energy. And it worked. Consumers trimmed their power costs by around 10 percent on average. Fast-forward three years, and you'll find that one half of the promised smart grid is on its way to becoming a reality. Utilities are now tracking power use from their control stations to the smart meters – built by well-established companies like Itron, Landis+Gyr, Sensus, Elster and General Electric – that have been installed at about millions of homes and businesses across the country (see The Year in Smart Grid). But the so-called "Home Area Network" that will bridge the gap from those smart meters into the home itself remains for the most part the realm of pilot projects. "We're just at the point where we're laying the network down," said John Quealy, managing director of equity research at Canaccord Adams. "Once you see these meters in, you're going to see another wave in the next year or two in network device-related applications." Nonetheless, the ecosystem is rapidly evolving. The following is a guide to finding your way around the home. To control a household appliance, you've got to first connect it to the network. Although some new appliances come with networking capabilities, most don't, so for the next several years, one of the big tasks will revolve around attaching networking nodules and intelligence to the appliances in your home. The first target for these efforts invariably is the heating and air conditioning system. HVAC consumes 16 percent of all of the energy in the U.S., according to the U.S. Department of Energy. Thus, expect to see smart thermostats get installed in conjunction with smart meters. It will then cascade to other appliances. Dryers, for example, use about 5,000 watts of power on average. Several utilities speak about setting up protocols to dryers to prevent them from running, or at least from generating heat, before 6 p.m. Lighting (if dimmable) pool heaters, pool pumps, washers and other appliances will be controlled as well. Even spare freezers, notorious power suckers, can be cycled off and on without risk of thawing, according to Adrian Tuck, CEO of Tendril, which makes home power monitoring and display equipment. As for how you'll control it, options include Web portals, stand-alone displays or controls embedded in devices like thermostats. On the cutting edge might be controls for cell phones and other mobile devices – Tendril launched such an application recently, and other makers of energy monitoring for the home are planning similar offerings. A smart meter now costs about $100 and the utility picks up the tab. Smart thermostats might cost $150 and up, and a nodule for an individual appliance will cost $10 or less. While utilities will install the meters and even some thermostats, expect them to do less as time goes on and expect consumers to plug in stuff. Utility Control or Individual Control? Nearly every company says that individuals want control over their appliances and that they are ready to give it to them. But it's a qualified control. Utilities will provide default settings based around pricing. "Do you want the utility to take corrective action if power prices exceed 15 cents a kilowatt hour?" "Do you want to be on the SuperSaver plan?" Questions like these will be put on an interface and users will then select their plan; then the utility with ratchet down lights and HVAC when appropriate. Consumers will be able to opt out, of course, after getting the warnings about how this could blow their cost savings. Think of it like a restaurant. You pick your food but someone else controls how it's cooked. Or maybe not. Some companies are looking to the possibility of jumping ahead of utility smart meter rollouts to bring homeowners home energy monitoring gear that could then be linked up to utilities via existing broadband connections (see A Broadband Smart Grid?). But observers note that these kinds of solutions will appeal to a limited class of early adopters willing to shell out hundreds of dollars to get a better grip on their energy usage. But WiFi could be another contender, since it already has a presence in so many homes. Its disadvantage is its larger power requirements, though GainSpan says it has developed a low-power WiFi module that could fix that problem (see An Old Favorite, WiFi, Preps to Disrupt Smart Meter Market). Powerline networking, through the in-development HomePlug standard, is running a distant, but respectable second, since it may be needed for about 10 percent to 20 percent of situations where wireless presents problems, Harrison said. Those could include apartments where meters are more widely scattered and separated by walls and other physical barriers, he said. Powerline can transfer more data, but it also costs more. (Smart meter and building control networking company Echelon Corp. has its own technology for powerline communications). All these standards, by the way, are for radio or powerline control inside the home to the meter. The meter will communicate to substations and utilities over a variety of protocols: RF mesh, cellular, broadband over powerline, fiber, etc. A lot of companies claim they aren't interested in hardware, but their products are really embodied in hardware anyway. The worry among hardware makers is that they could be subject to commodity competition and pricing. The Boulder, Colo.-based Tendril Networks makes energy displays, wall outlets and thermostats that talk to one another using the ZigBee communication standard. The startup has deals with about 29 utilities and expects to announce a commercial rollout in 2009 that will involve about 5,000 to 10,000 new homes a month, along with about ten more field trials. Still, it recently had layoffs, and has announced it will license its software to third-party equipment developers. EnergyHub makes software and touch screen control panels to track and display home energy usage. The New York-based startup says it plans to start selling directly to consumers as well as to utilities sometime in the middle of 2009. The Petaluma, Calif.-based, privately funded Threshold is also making a suite of wireless home control systems, including some energy-monitoring and savings devices. The devices use OneNet, an open-source wireless standard, to communicate with each other, though they can also "talk" with WiFi, ZigBee, Z-Wave and a host of other communications. Expect to see products for sale over the Internet by year's end. Energate makes smart thermostats that serve as home area network hubs, communicating via ZigBee or other standards with a variety of smart home devices. 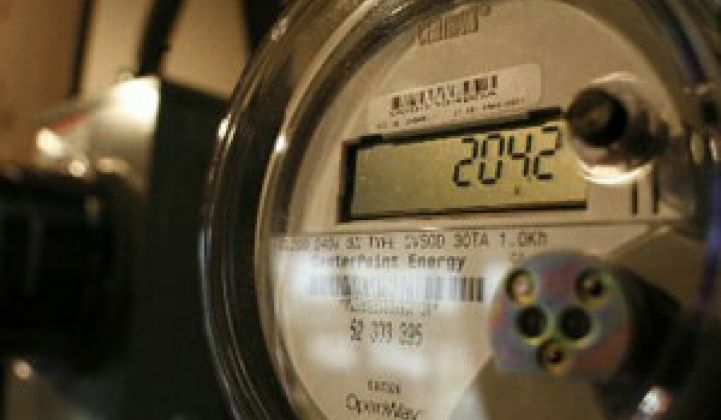 Its thermostats are in use in pilot projects with Hydro One and Louisville Gas and Electric, and it is partnering with smart meter communications networking company Tantalus. Cooper Industries Ltd. bought Cannon Technologies Inc., which makes smart thermostats, a few years ago and now has deals with PG&E, Baltimore Gas and Electric and other utilities to supply power demand management and energy efficiency services. Aztech Associates makes wireless in-home display devices and time-of-use clocks that tell homeowners how much power they're using and when it's most expensive. Its products are in use in pilot projects including Louisville Gas and Electric and Canada's Hydro-Quebec. Radio Thermostat Corporation of America is making a thermostat that can communicate via WiFi (see Get Ready for the WiFi Thermostat). The company also makes in-home displays and wall socket devices that can be controlled for demand response. Control4 builds home control systems that show power usage and allows lighting control via a television interface – a recent add-on to the company's home entertainment and security monitoring systems. It has a deal to supply control systems for GE Home Technologies systems, and it's also looking to partner with smart grid software developer Gridpoint to use homeowners existing broadband connections to link them to utilities in advance of smart meter rollouts. Onzo, a United Kingdom-based maker of energy dashboards and devices, has a £7 million order for its products with utility Scottish and Southern Energy, which holds the rights to distribute them in the U.K. and Ireland. That's perhaps not surprising, considering that Onzo received a £1 million investment from the Scottish utility, along with £1 million from the utility's Sigma Capital Group, in exchange for a 49-percent stake in the company. Comverge Inc. (NSDQ: COMV) fits into the home area network in a slightly different way. As a provider of demand response services, it allows utilities to cut power use in homes at peak demand times using one-way pager networks, and has installed in-home energy displays, smart thermostats and digital controls in projects with more than 500 utility customers. In a nod to the emerging dominance of smart meters and broadband connections as pathways to the home, Comverge has also launched software aimed at giving utilities a platform to monitor and control systems based on both modes of communication. Join industry leaders to discuss the future of green building at Greentech Media's Green Building Summit in Menlo Park, Calif., June 11.